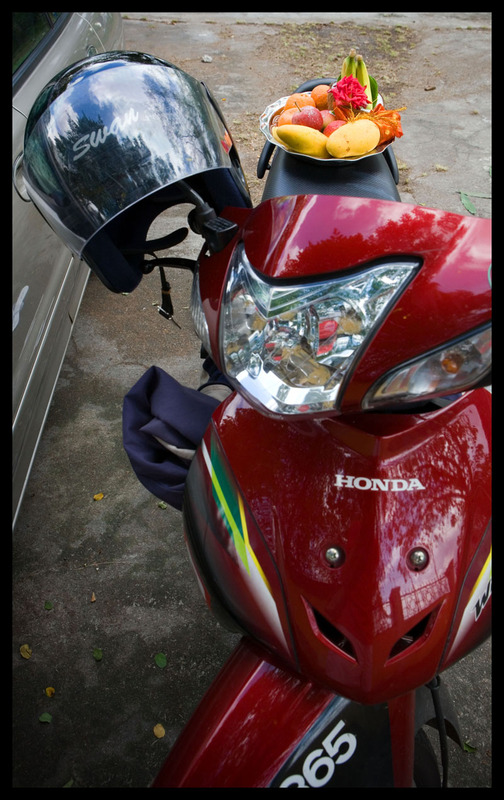 We're in Bangkok on a short assignment. Less than twenty-four hours we've been here, and my oh my have we eaten well. 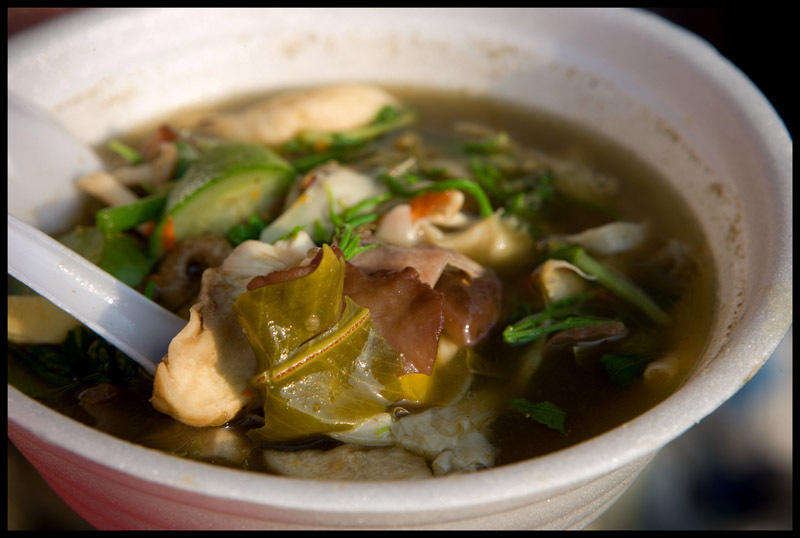 Two hours ago: gaeng het (mushroom curry), a big bowl of love cooked up on Thanon Larn Luang by a cart-pushing Isaan native. Her fungi-packed display case (cloud ear and oyster mushrooms, meaty het lom, and various other unidentifiables) stopped us dead in our tracks. A gander at the array of greens on her cutting board decided us on an order. Gaeng het prep is quick: a couple ladels of broth (slightly herbal, very vegetal) into the pan, followed by handfuls of cubed pumpkin and loofah gourd, a spoonful of pickled something, and plenty of each variety of mushroom. After it's brought to the boil the curry is seasoned with bplaa raa, fish sauce, chopped fresh chilies to taste, and white pepper. In go plenty of chopped greens - pumpkin vine, something resembling Vietnamese rice paddy herb - and, if you like it sour, copious slivers of a long green and reddish shiny leaf that tastes a lot like lime (but isn't lime leaf). A fistful of chopped cha om and basil finish the dish. This must is the most restaurant-like street food we've ever had. 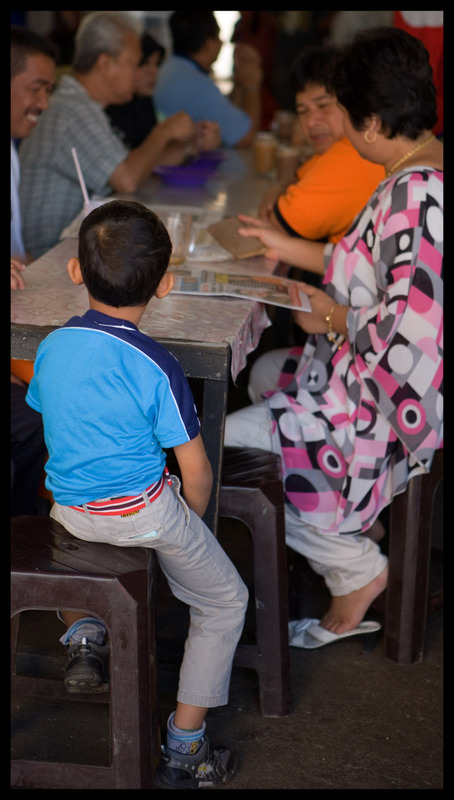 It made us long for a proper table and chairs, a side of sticky rice, the setting in and time with which to linger over it. Still, standing on a curb, passing the bowl back and forth, we basked in the rich meatiness of the mushrooms, the curry's brilliantly green vegetal notes, its bracing spiciness (we asked for extra chile), the light sourness offset by sweet pumpkin, and the mild little hits of white pepper heat that competed for attention with boldly fishy bplaa raa. 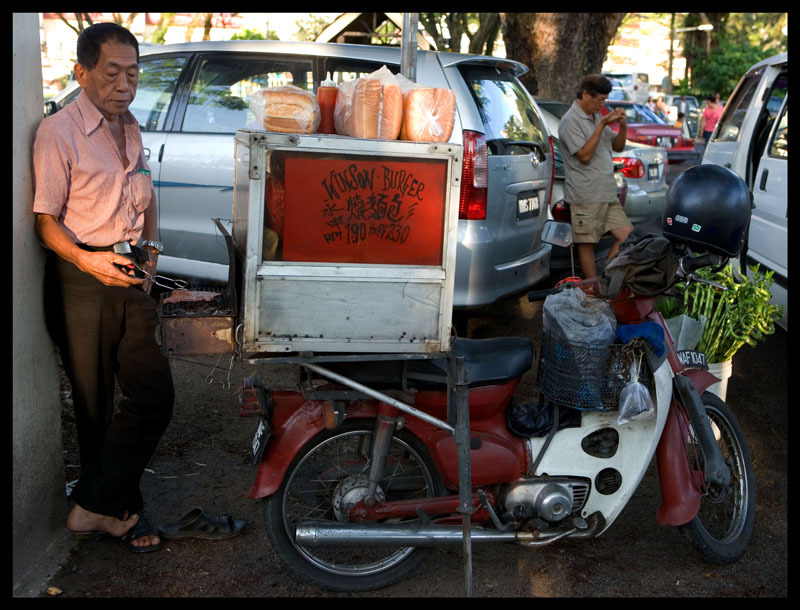 This vendor is ever on the move, but her gaeng het is well worth the hunt. 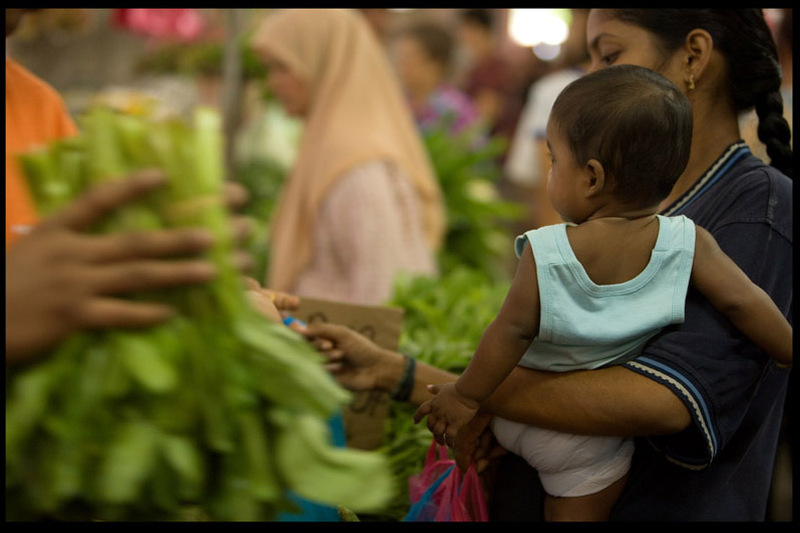 Try the market on Thanon Larn Luang by the bridge, in the evenings. 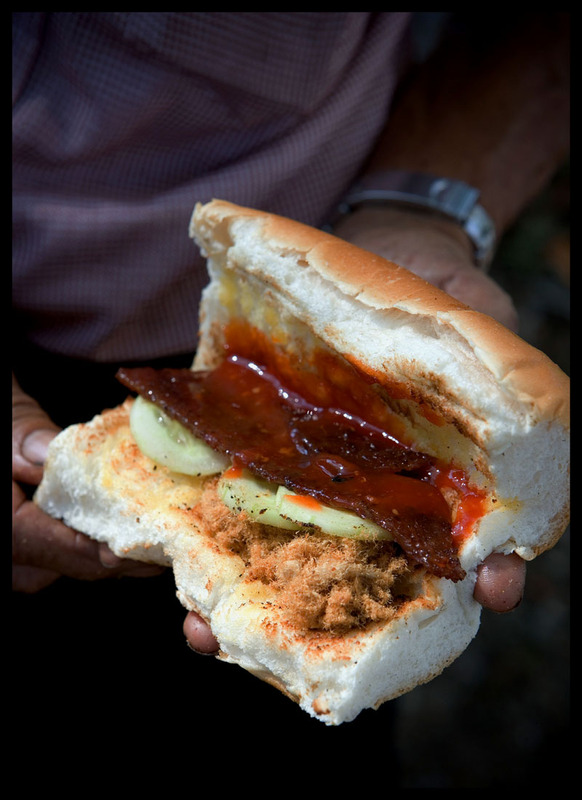 One measure of a country is how well one can eat on its roads. Italy, with its autostrada pit stops serving toasted panini and espresso (and selling hunks of aged parmesan Reggiano and every sort of salumi under the sun), scores pretty high. So does Thailand. 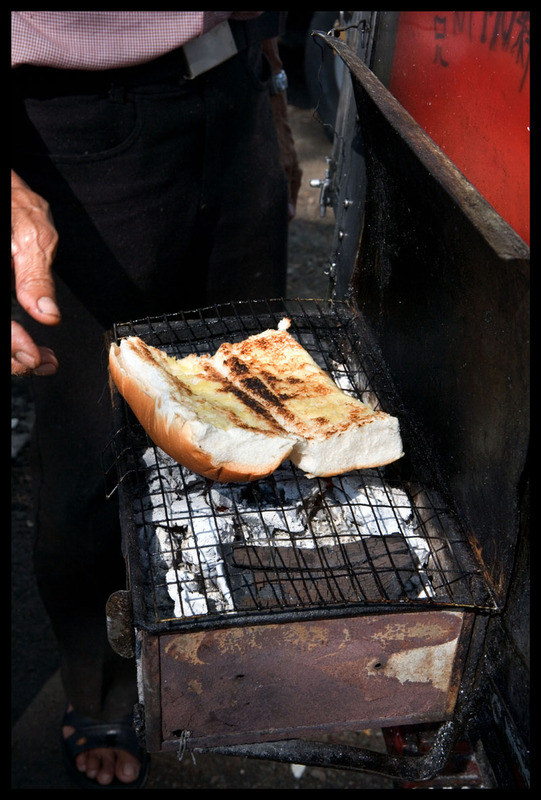 On our last tour up north we rarely drove more than half an hour without encountering a tempting edible, everything from barbecued chicken to ice-cold corn juice (incredibly refreshing). Our beloved Malaysia disappoints in this department. 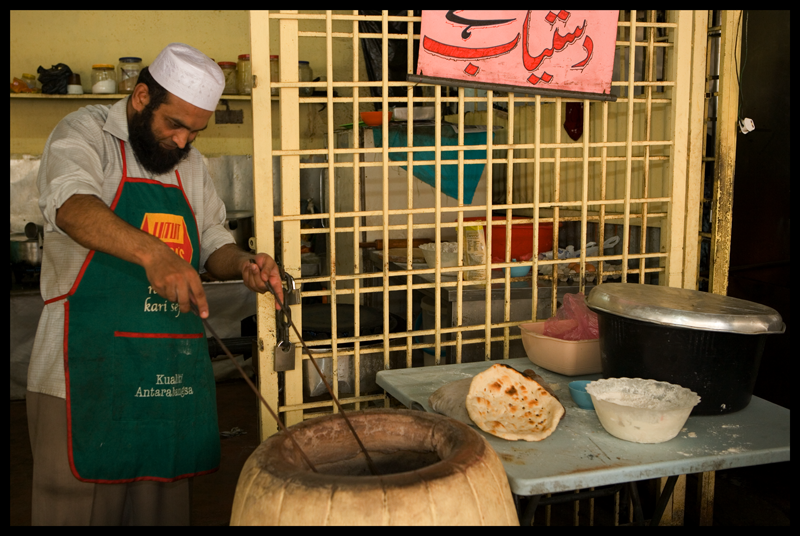 The main north-south highway is dotted with official rest stops that dish up nothing of worth. 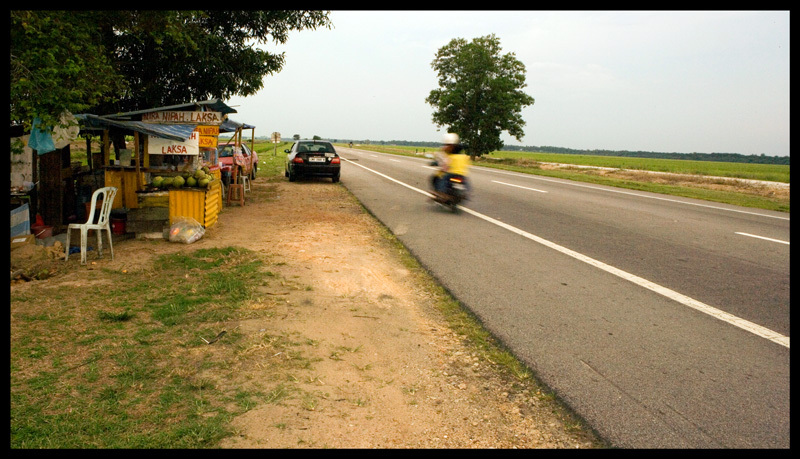 Finding eats in the kampung (villages) lining smaller roads is more often a miss than a hit. 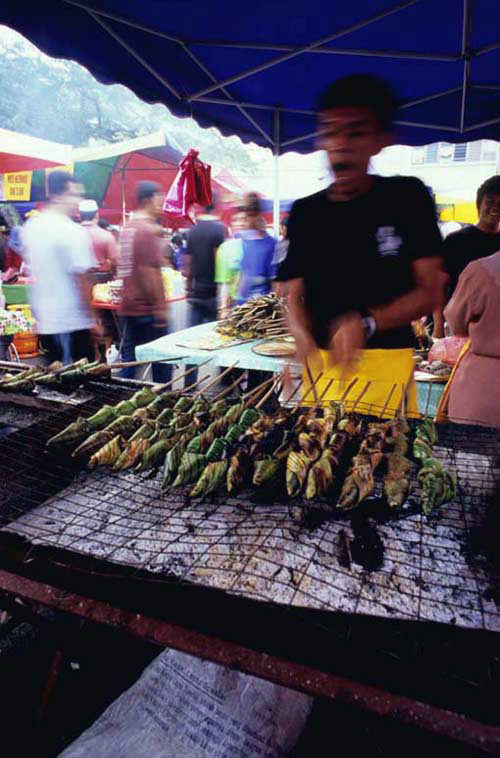 Most boast a tom yam or ikan bakar shack or two that appear to be after dark-only operations. The daytime driver can travel quite a while without running into a snack. 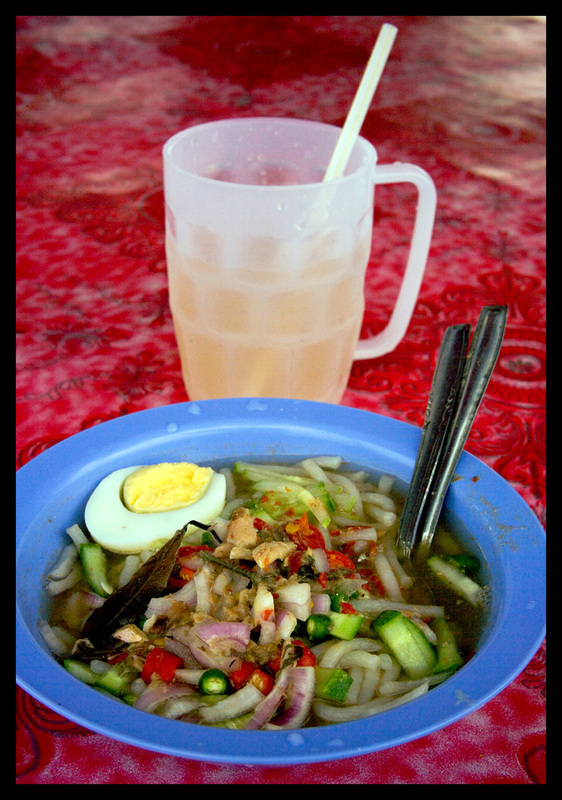 So this laksa lean-to, on highway 58 north to Setiawan, was a pleasant surprise. 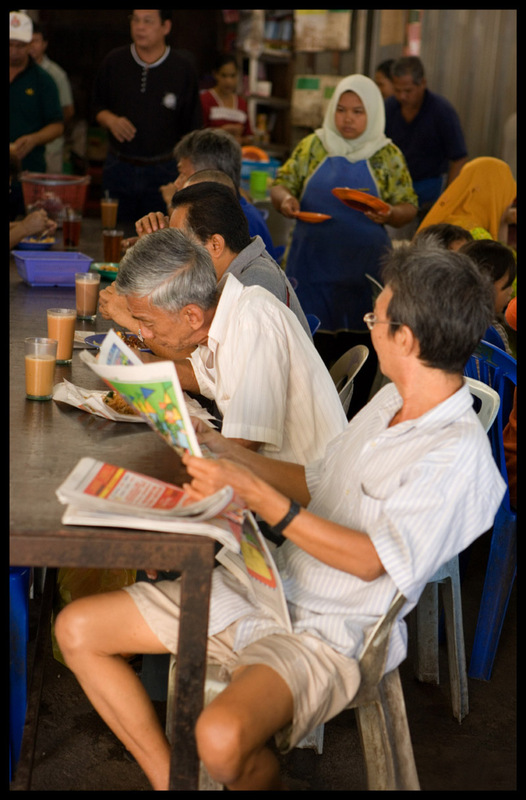 The menu here is short - laksa, fried bananas, and kueh (sweets). To drink, air nira nipa and coconut juice. From the table inside, we enjoy a calming view of endless emerald rice paddies and shudder at the sound of unnervingly close high-speed traffic. 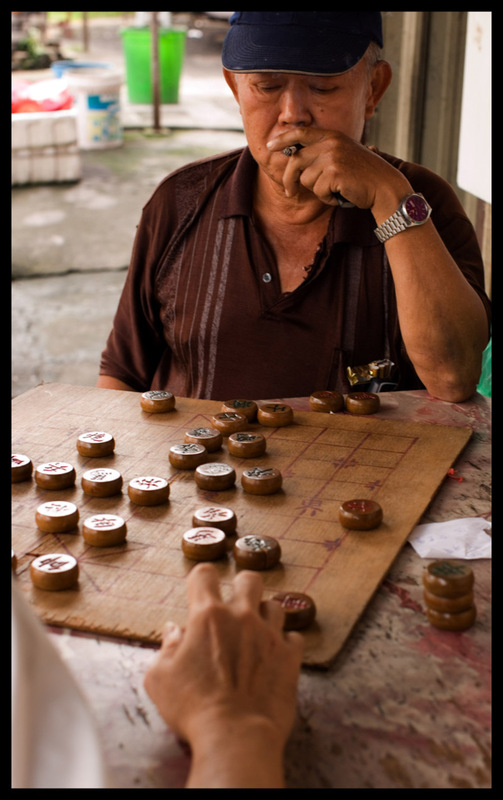 The elderly couple running the place is friendly and he, despite protestations to the contrary, speaks excellent English. They've been in business for over a decade and enjoy a steady parade of customers (on a Sunday, at least). 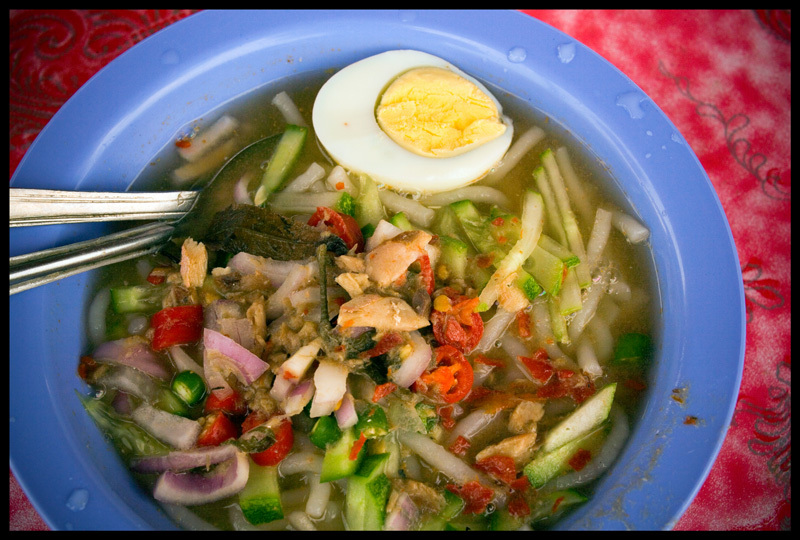 She describes her laksa as Penang-style. 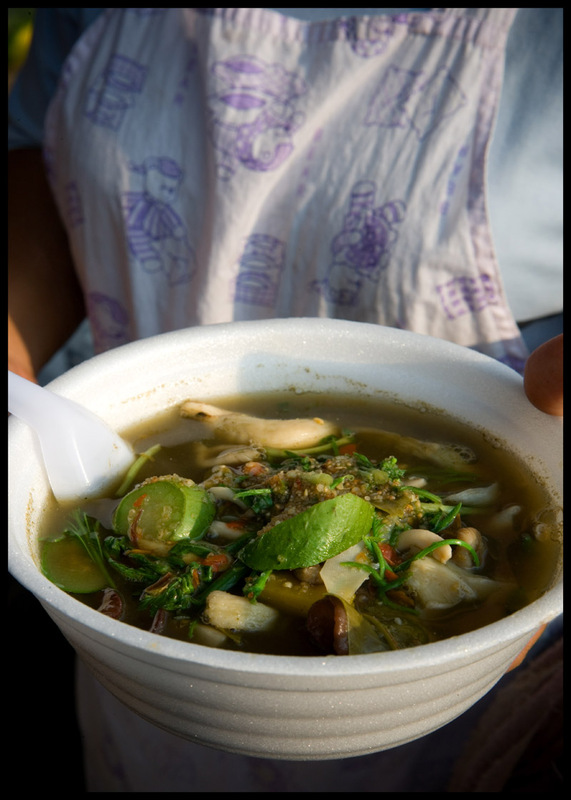 It's extremely spicy and very sour a la the northern island, but the broth is uncharacteristically clear. 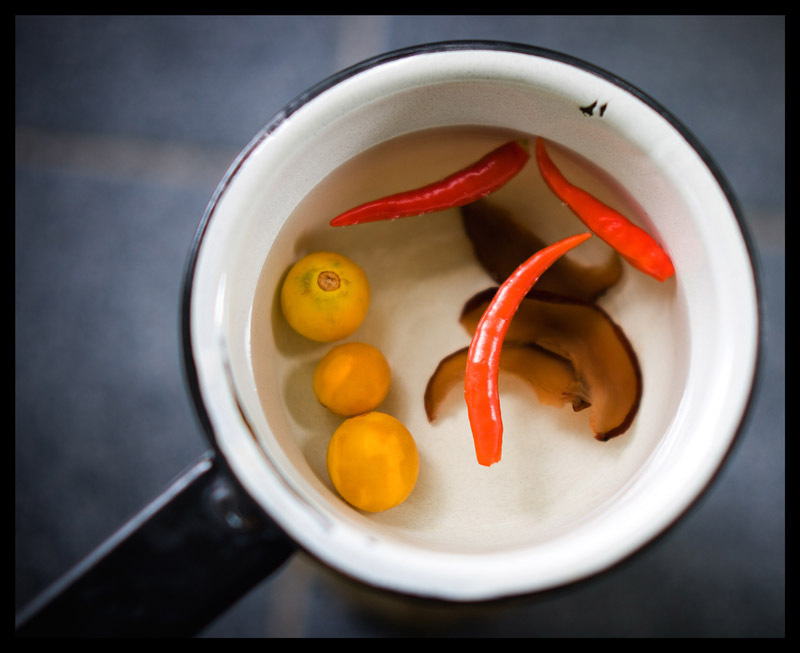 What this bowlful has going for it is big chunks of fish, a pronounced tang that I suspect is derived more from tamarind than from the sour slices known as asam keping, and loads of sliced fresh chilies that tingle our tongues and burn our lips. Just the thing to recharge the batteries of a tiring driver facing another couple hours behind the wheel. 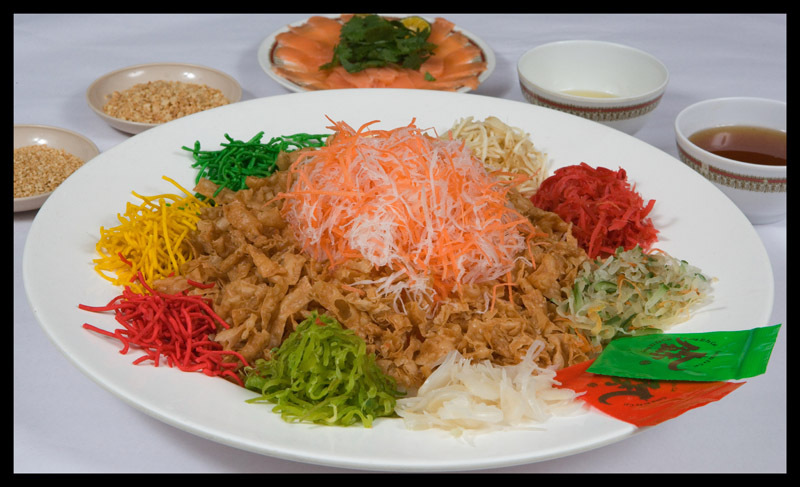 ...in Singapore and Malaysia, at least, for yu sheng (yee sang, in Cantonese), a dish of raw fish tossed - for luck - with sweet, sour, fresh, fried, and crispy ingredients. 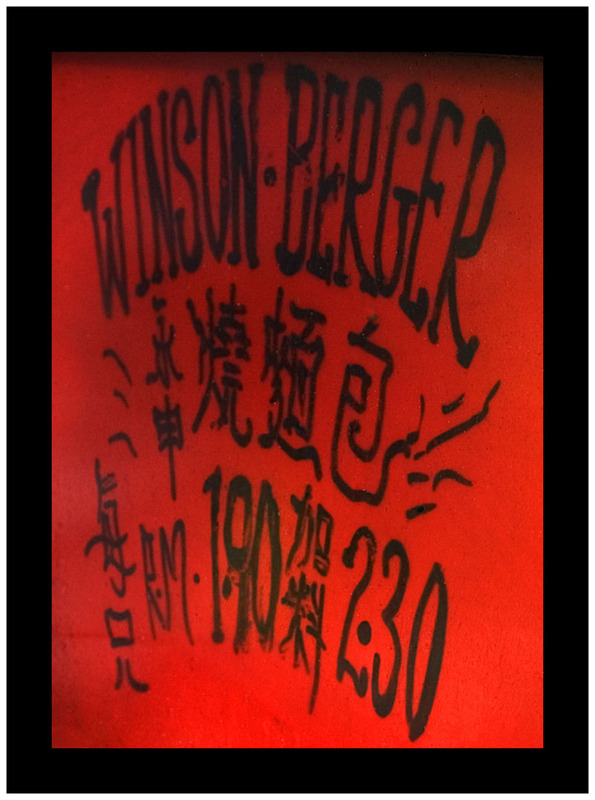 Both Singaporeans and Malaysians lay claim to this Chinese New Year banquet fixture, but it probably originated in China's Guangdong province. Read more in the Wall Street Journal, here. A trip to the wet market never fails to turn up something new. 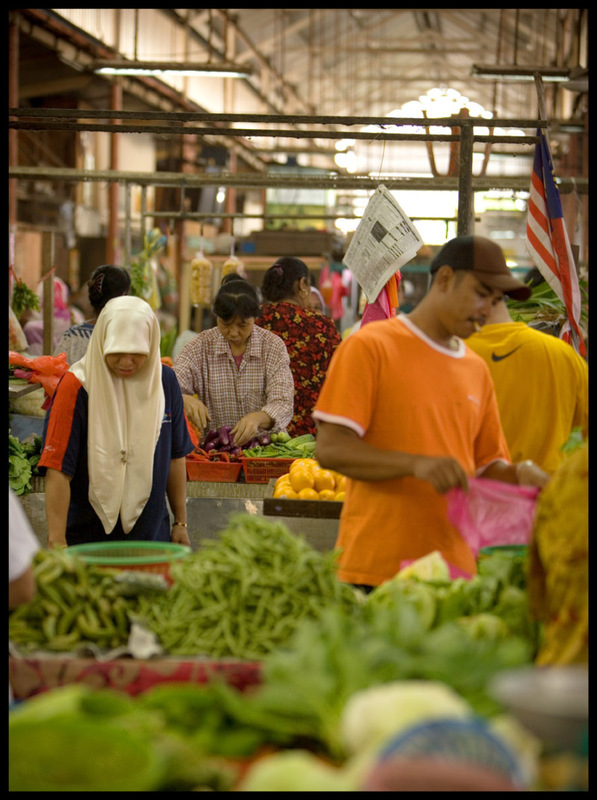 This morning's visit to Temerloh's always enjoyable Pekan Sehari ('one-day' market - Sunday mornings only) was no different. Today every other vegetable vendor, it seemed, was displaying small piles of hairy eggplant. We'd seen 'bald' versions of these bristle-haired vegetables in Thailand, where they're called ma-euk; in Nan we learned to squeeze their innards into nam prik kapi (shrimp paste 'dip'). But we'd never encountered them with their fur (we didn't know they have fur), so we didn't know what we were seeing. 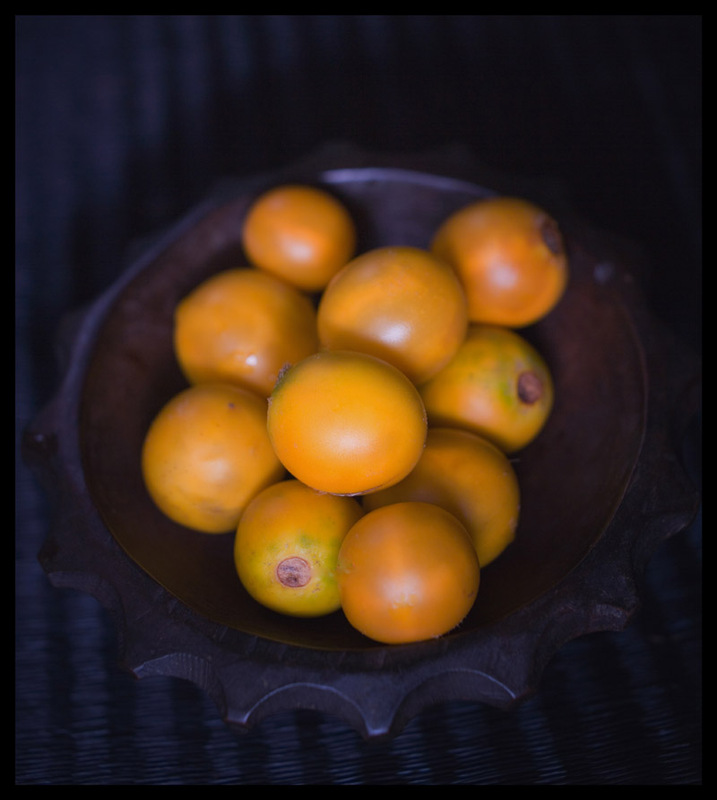 Malays call this member of the Solanum genus buah terung asam, or sour eggplant 'fruit'. 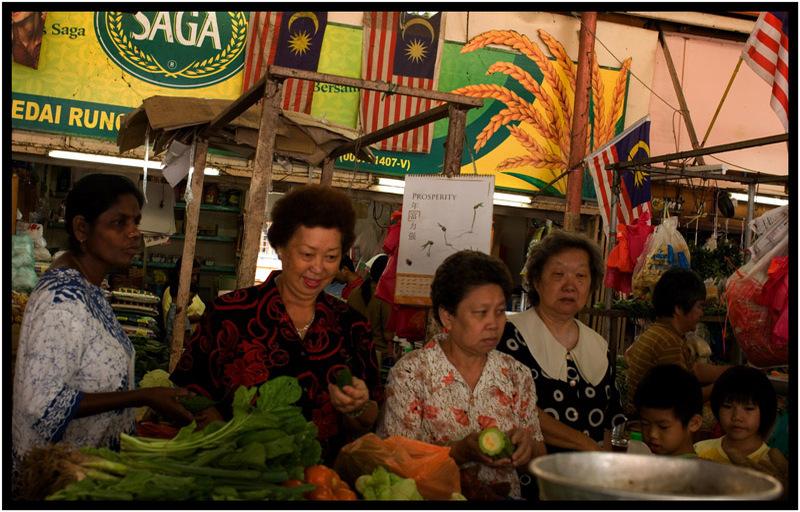 The vendor who sold us our tumpuk (pile) told us the hair could be easily removed with the blade of a knife (she was right - a matter of a few gentle scrapes), and a fellow customer shared a recipe for a hairy eggplant condiment to eat with rice. Once we got home I gave the lot a good shave and wash and then ate several uncooked, out of hand. 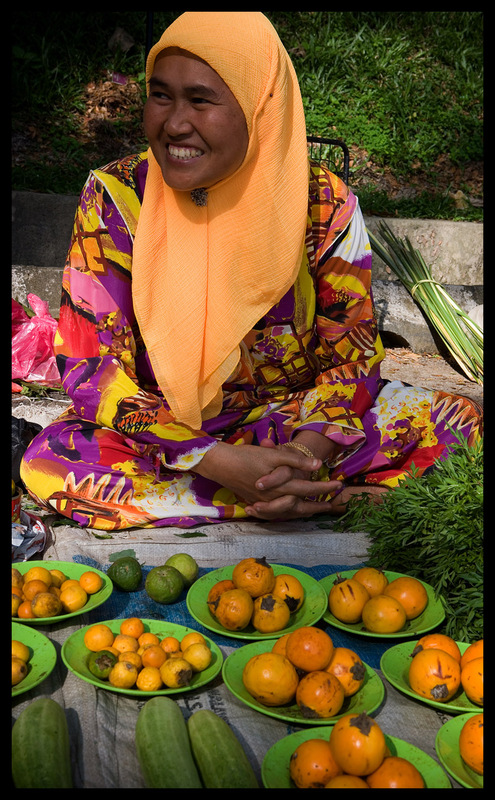 Raw, this variety of eggplant that Malays call a fruit tastes nothing at all like a vegetable. 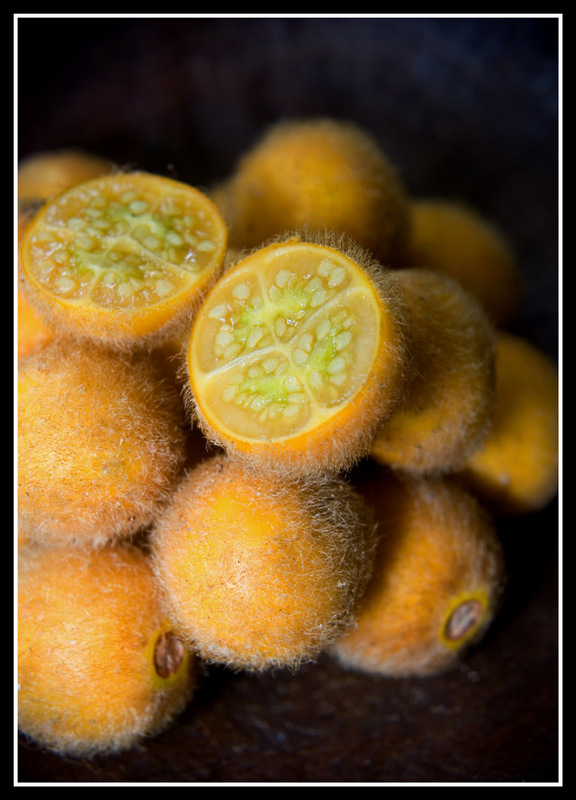 It's thin-skinned and juicy, pleasantly sweet-sour, and has a somewhat floral essence reminiscent of passion fruit. The rest I put in a pan with water to cover and added asam keping (the dried slices of a green fruit called buah asam that give Malaysia asam laksa its hallmark sourness), a few chilies, and a hefty pinch of salt. After the liquid came to a boil I allowed the eggplant to simmer for just a few minutes, removed the pan from the heat, and let the vegetables cool in their water bath. Cooking brought out the eggplant's vegetal flavor, but they still retained quite a bit of sourness. 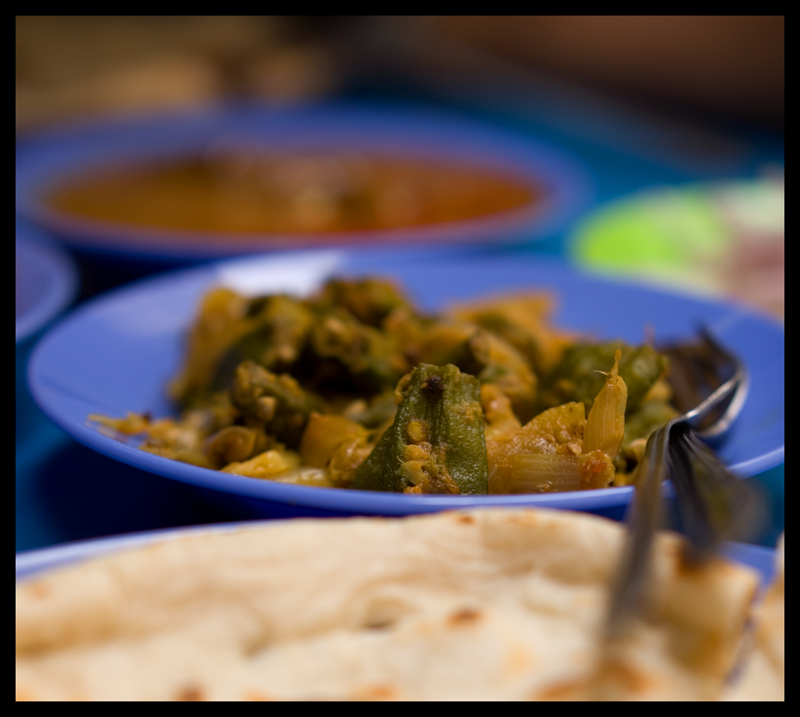 This will indeed be a delicious piquant accompaniment to a plate of rice and a rich, coconut milk-based Malay curry. 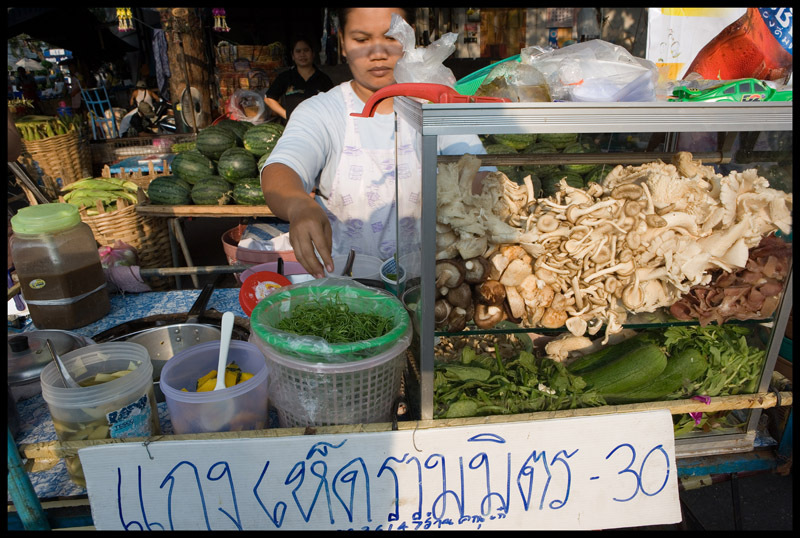 You might find shaved hairy eggplant at Thai supermarkets, fresh or frozen. Definately worth a try, raw or prepared as below. 1. Place eggplant, asam keping (or other souring agent), chilies, and salt in a small pan. Add water to cover. 2. 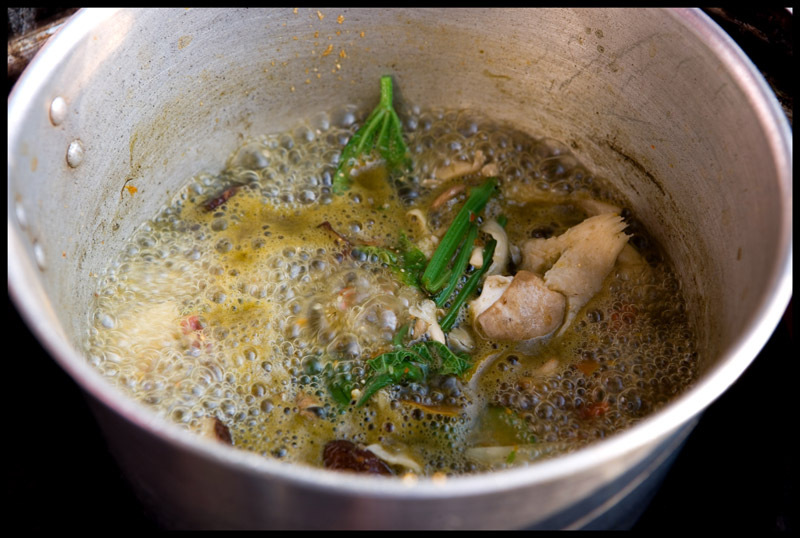 Bring the water to a boil, then turn down the heat and simmer a few minutes. The eggplants are done when they give to pressure. Remove from heat and let them cool in the liquid. Store in the refrigerator but serve at room temperature, on their own or with rice. We're in the food court of our new favorite KL wet market and, having just finished coffee and toasted, halved buns sandwiching kaya (coconut 'jam') and grossly thick slabs of butter, are about to give up our seats, when my eye wanders to the other end of the table. Two young women are eagerly tucking into noodles. One of the eaters dives in with her chopsticks, secures a tangle, lifts it high, then brings it back down to the bowl. Over and over again she does this, coating the noodles in thickish dark goo. 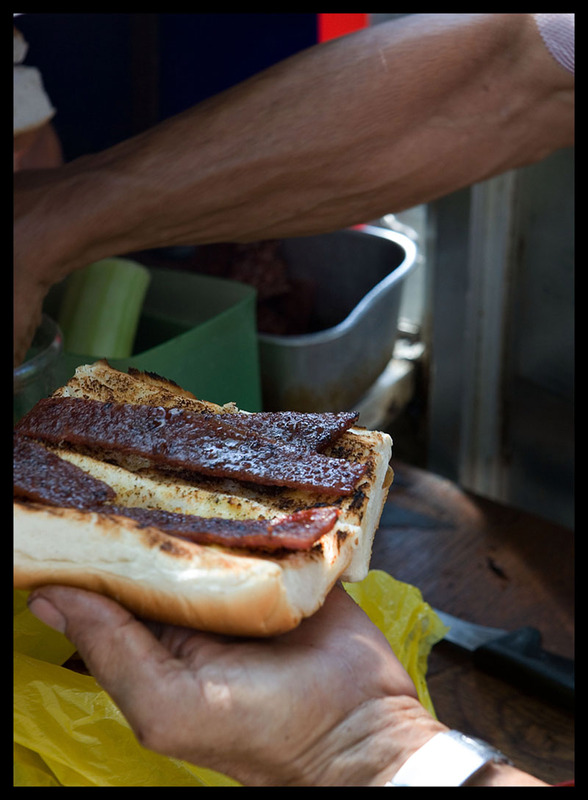 We've been in Malaysia for a while now, and when it comes to tempting edibles we're getting pretty jaded. But Oh. My. Got to have one of those. 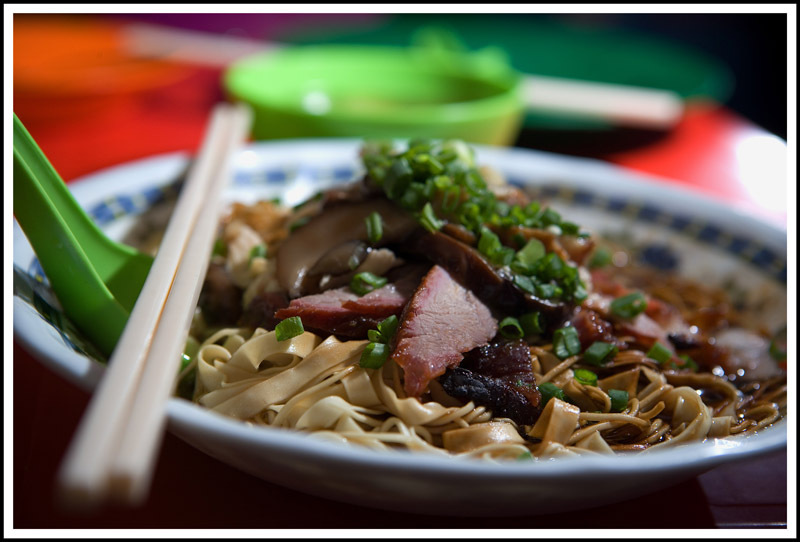 The old guy behind the cart serves plain old wonton mee and a not-too-uncommon twist on wonton mee, topped with stewed mushrooms and chicken feet instead of pork. 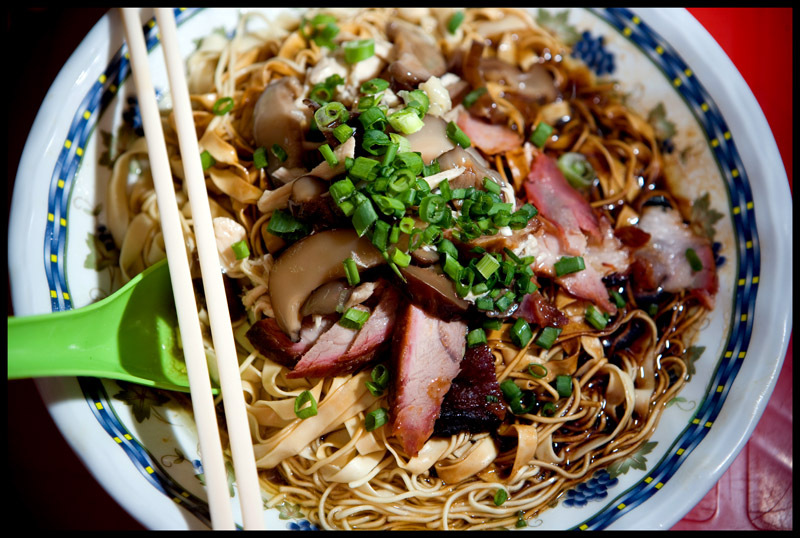 Order 'everything, dry, mixed' and you get it all: a nest of both wide and thin egg noodles sauced with dark soy and topped with thickly sliced mushrooms, sticky char siew (barbecued pork), bits of chicken, chicken feet (we opt out on this item), and chopped green onion. The pork's great and the chicken is fine, but what makes this dish is the overwhelming forest-floor essence of the funghi. The rest of the ingredients are bit, albeit pleasant players in this one-act play of shroominess. We've never eaten anything the likes of this pasta, not even in northern Italy at the height of fresh porcini season. This guy could teach us a thing or two about coaxing every ounce of flavor from a mushroom. But if he's like most hawkers, he won't. 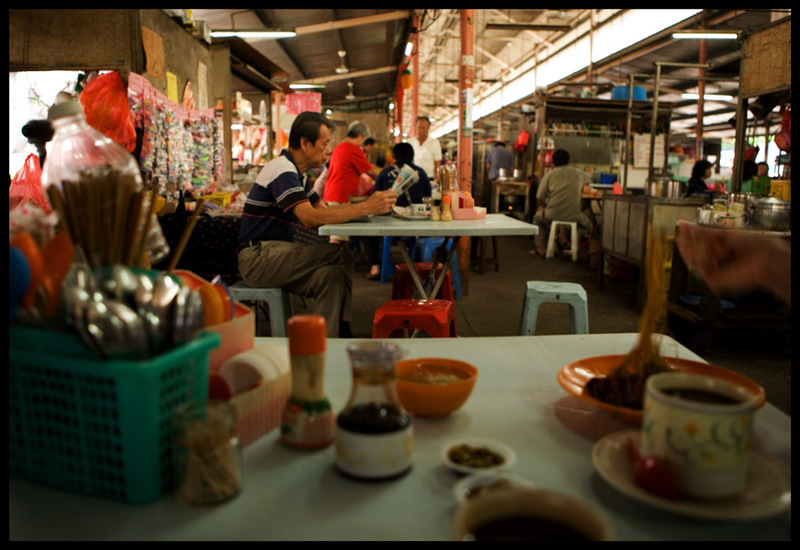 All we can do is return to his stall to supplicate in front of another couple bowls of his magic mushroom mee. 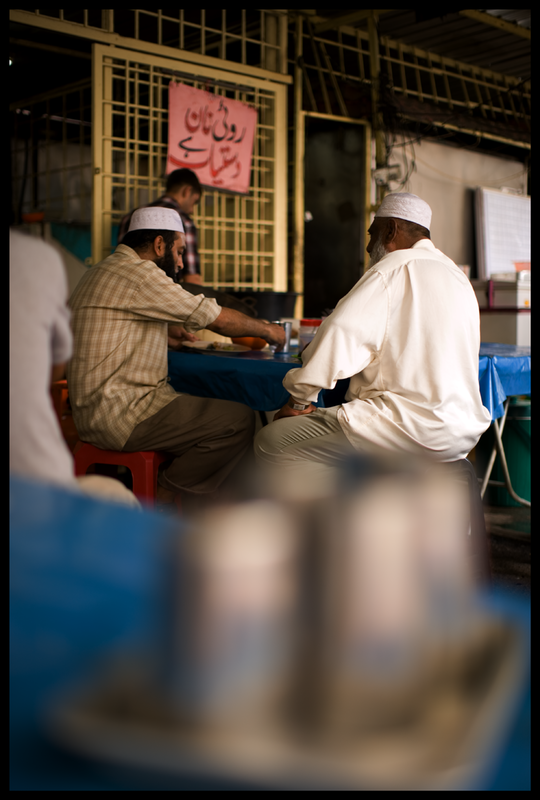 Wonton mee stall, across from coffeeshop sporting yellow 'Hainan Tea' banner, food court of Imbi Market, behind Jalan Imbi, downtown Kuala Lumpur. Mornings. 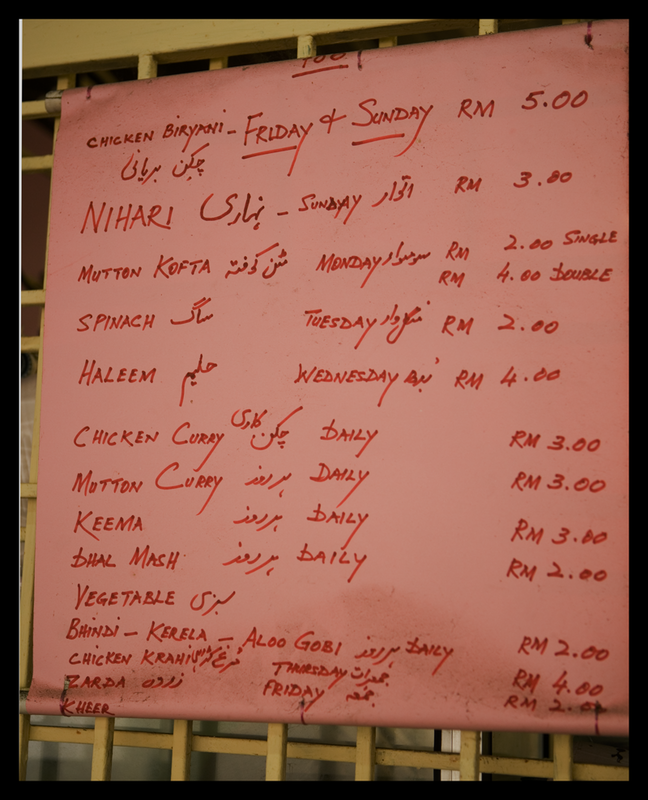 A mere 5 ringgit a bowl for everything but the chicken feet. 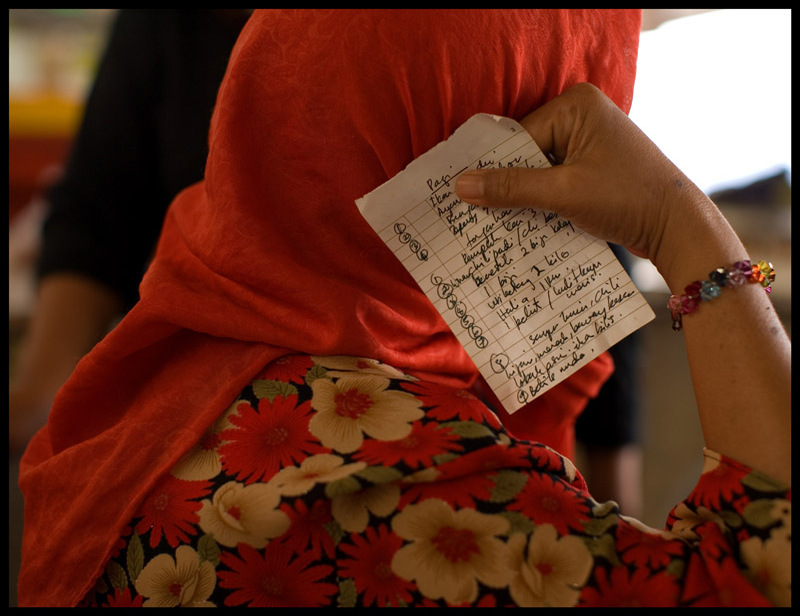 The streets of Kuala Lumpur hide small, usually anonymous treasures. 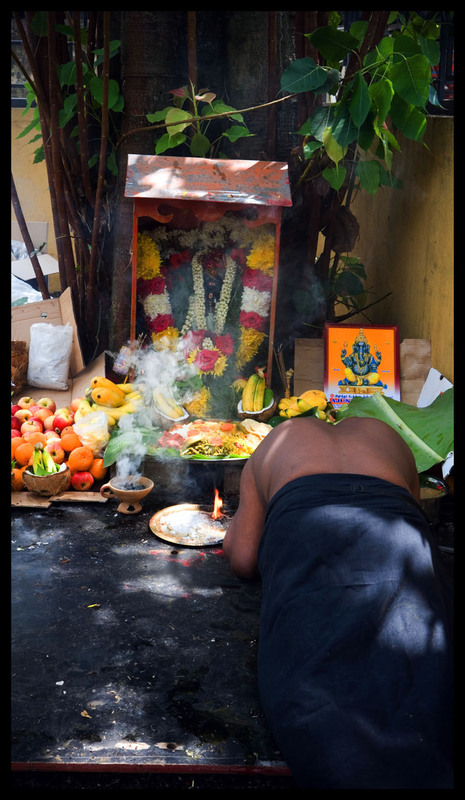 We've often wandered past makeshift Chinese and Indian shrines tucked away in alleys or lodged under trees and wondered what they're about, how they came to be, who worships there. Near Imbi market we're alerted to an auspicious Indian occasion by the presence of hanging decorations made from coconut leaves. A new shrine to Ganesha, the Hindu elephant god, remover of all obstacles, is being conscecrated by a priest (in black) and his assistant. We're waved over by the small group of worshippers. 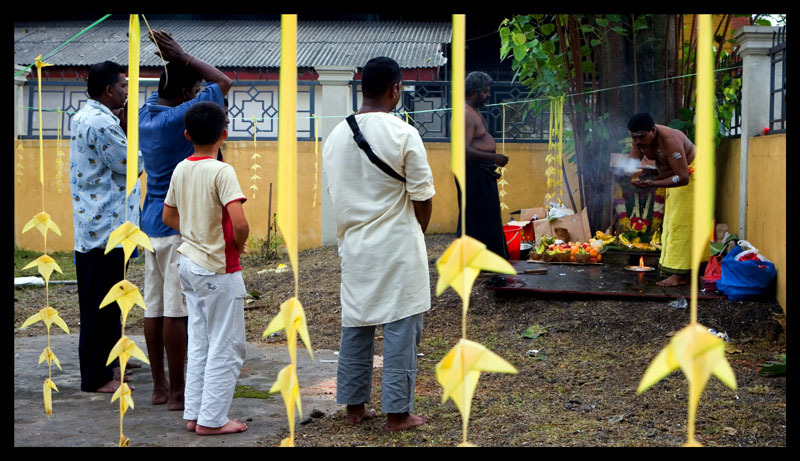 The shrine, or tiny temple, sits at the base of a sacred Bodhi Tree, a type of tree that, we're told, is rarely found in Malaysia's urban areas. One of the worshippers, a young man, 'owns' the shrine. The idea to set it up just came to him, he says. He arranged for the consecration ceremony, hiring the priest and arranging for a vegetarian meal to be served afterwards. He will be responsible for insuring that the temple is maintained and, when necessary, re-consecrated. 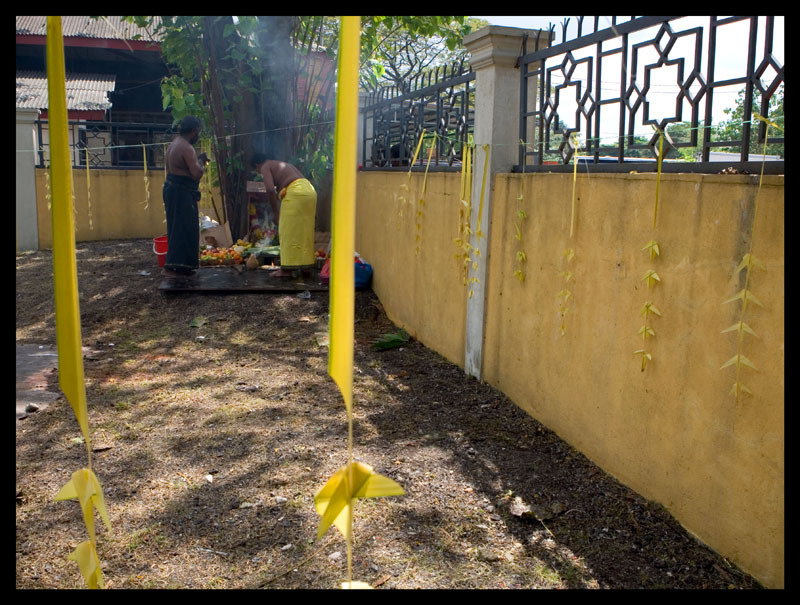 The priest begins by purifying the ground around the temple with turmeric water. 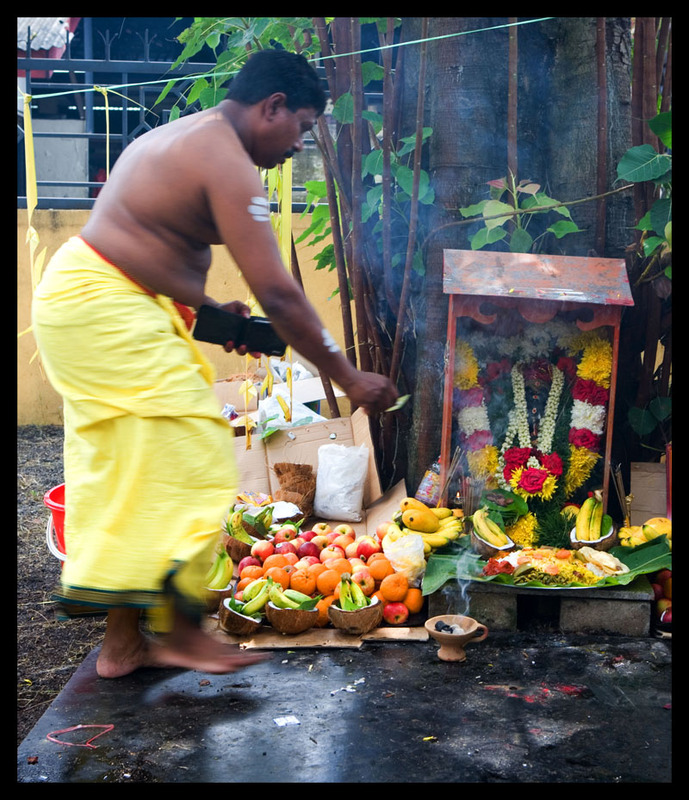 Observers get a spray of drops as well, and are then invited past the line of coconut leaf decorations and onto temple's 'grounds'. Laid before and to the side of Ganesha are apples, oranges, and mangoes, bananas in coconut halves, and a plate of rice topped with vegetarian foods. All will be distributed to worshippers after the ceremony is over. Incense is burned and a flame passed before and around the shrine. A sanctified coconut is split in half and its water poured before the god. 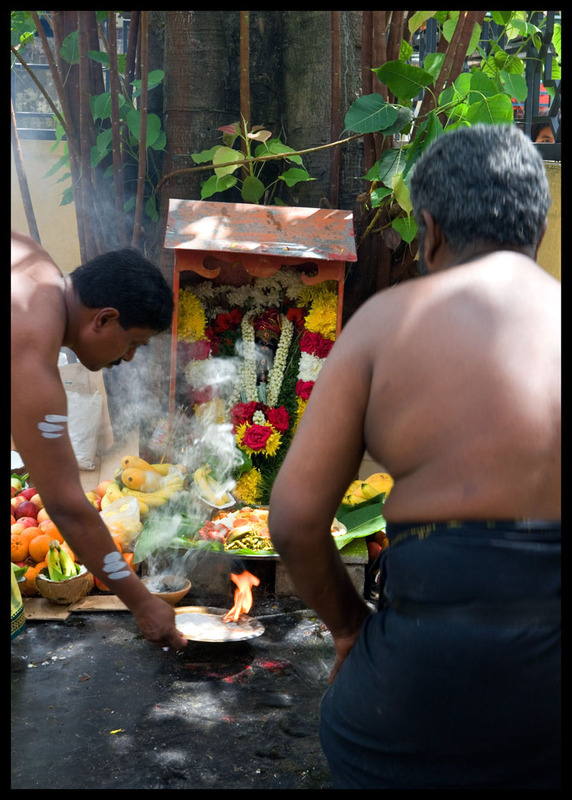 After offering chandan, a powder made from sandalwood, to Ganesha, the priest smudges it on the foreheads of worshippers. Those observing the ceremony from the temple's temporary 'kitchen' on the other side of the fence get a smudge as well, and so do we. Before the ceremony is finished fruit is distributed to worshippers. The priest places it on a metal plate, along with a flower from one of Ganesha's garlands. Recipients rest their fingers on the rim of the plate as the priest blesses the fruit. And then we're invited to lunch. 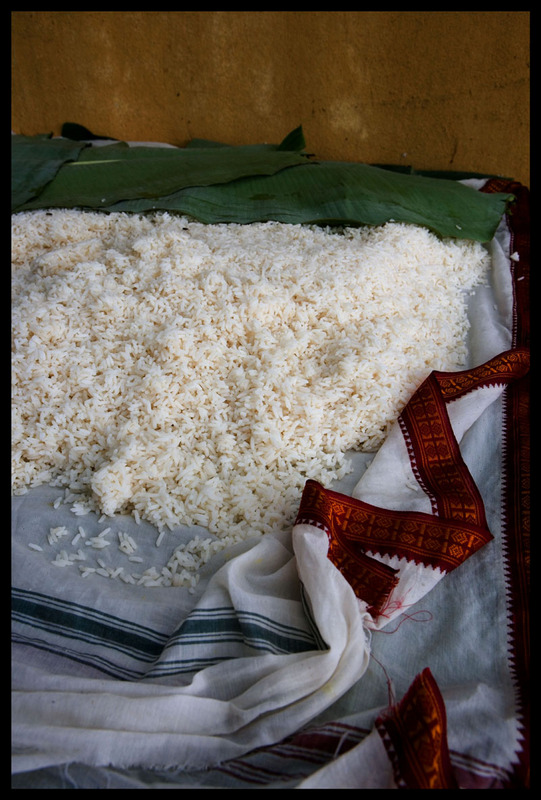 Over in the kitchen, a 30-second walk from the temple, rice is swaddled in banana leaves and cloth. 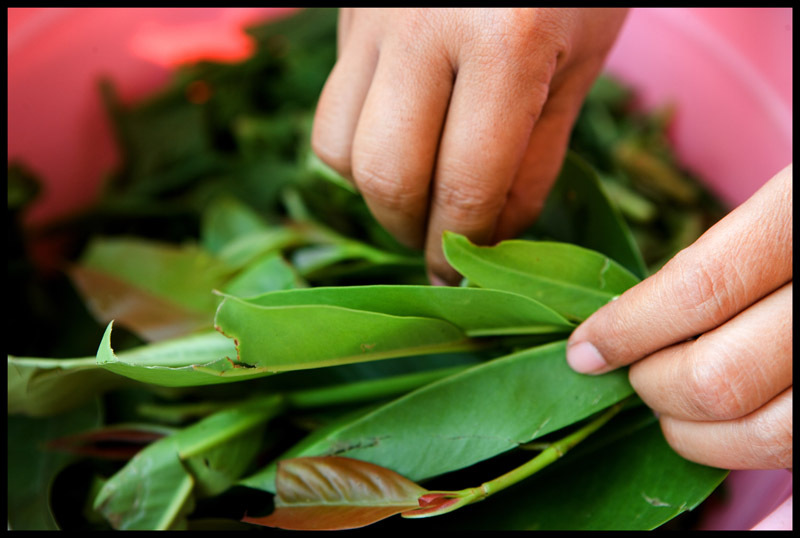 It's spooned onto banana leaves laid side-by-side on a long, makeshift table. 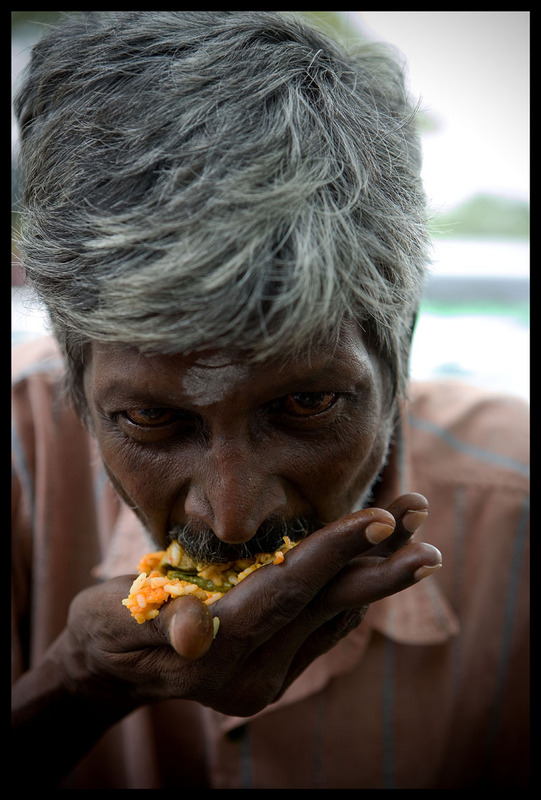 Out come bowls of southern Indian vegetarian dishes one after another, so many I lose count. There's cabbage stewed with turmeric and cubes of firm tofu in a chile-tomato sauce. There's gravy thick with chunks of eggplant and potato and carrot, curried pumpkin, a raita of yogurt, cucumber, and onion, and a wonderful rice treat sweetened with jaggery. 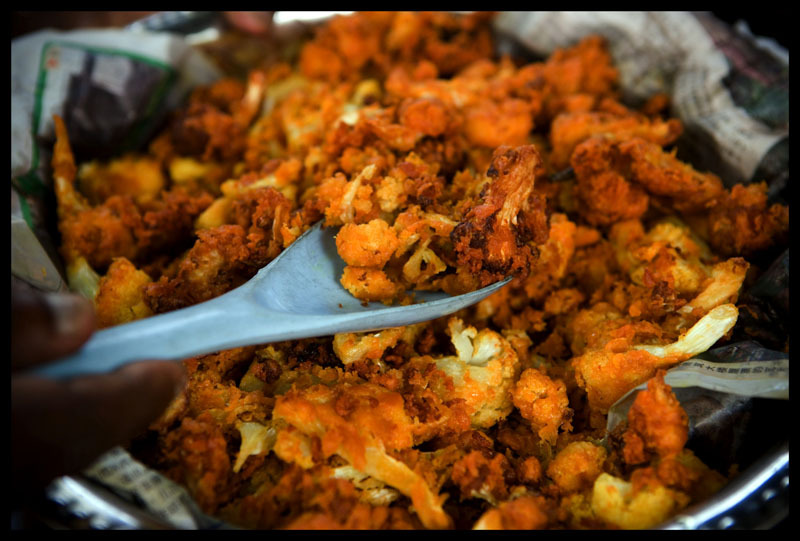 And there's a fried cauliflower dish that's found on most Indian menus, but this version is the best we've ever eaten, light on batter and grease, long on spice, and so light it almost floats. We're not the only non-Indians here. 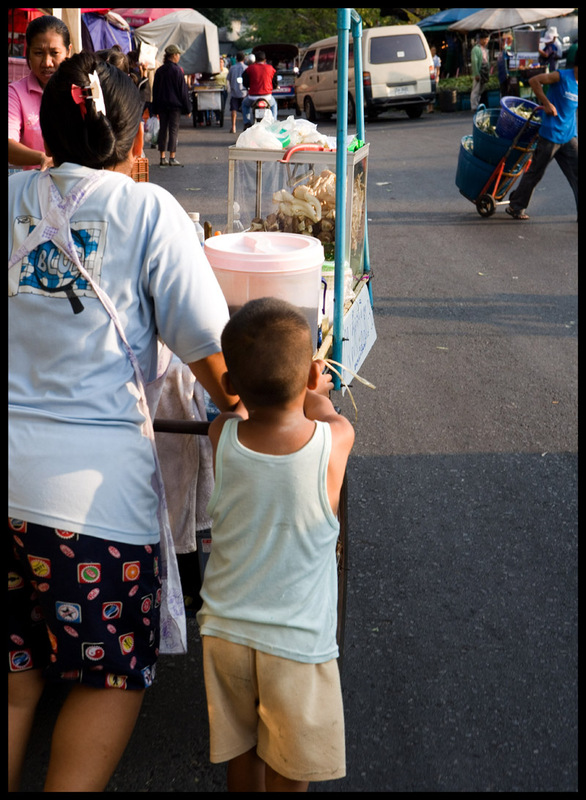 Next to me sits a Chinese man who's worked at the market for years and, next to him, another Chinese vendor and his son. All wear a smudge of chandan on their foreheads. 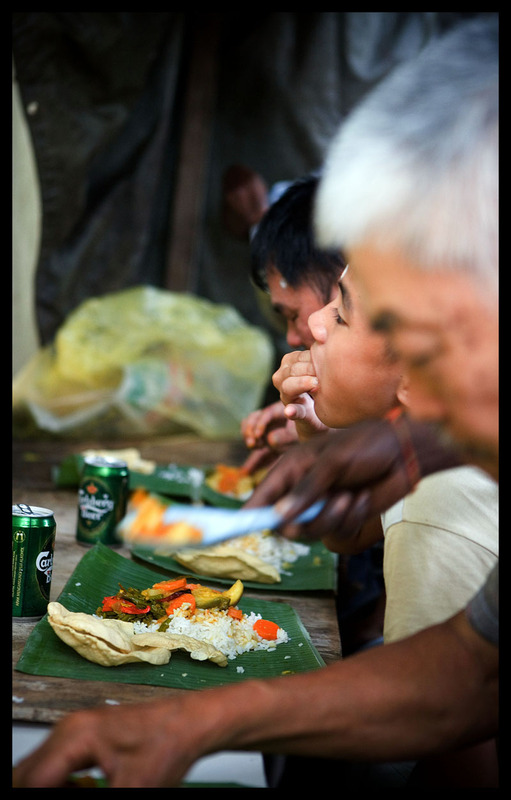 The mound of food on our banana leaves grows even as our stomachs shrink. We're forced to refuse the repeated offers of seconds made by our hosts. 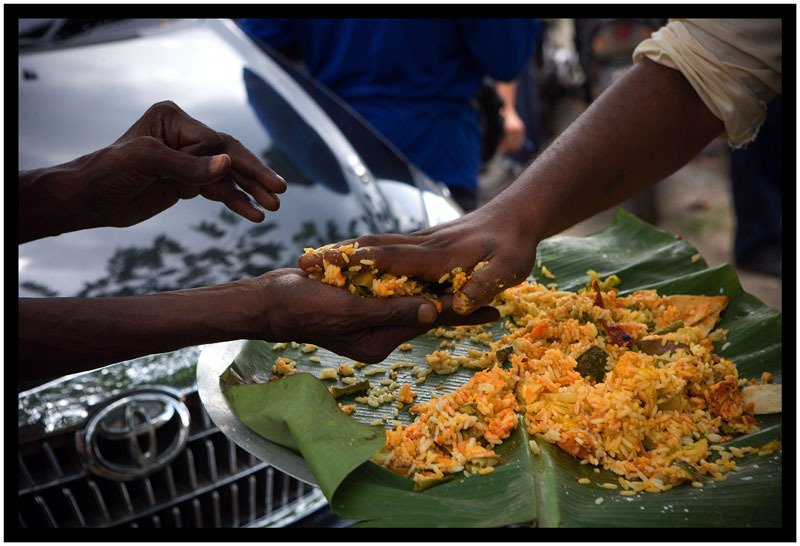 After a while the owner of the temple appears with the platter of rice that was offered to Ganesha and offers it around (see opening photo). Tonight he'll fly to Kerala to make the pilgramage to Sabarimala Temple, an annual pilgramage that's the second largest in the world, after the Haj. 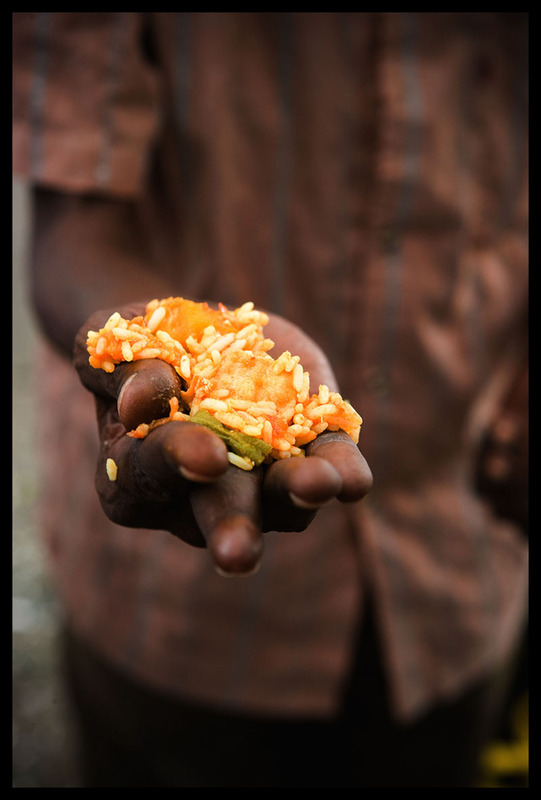 It's an auspicious thing to do, ingesting this rice that's been given to the god, and everyone wants a handful. When we can eat no more we push ourselves back from the table. 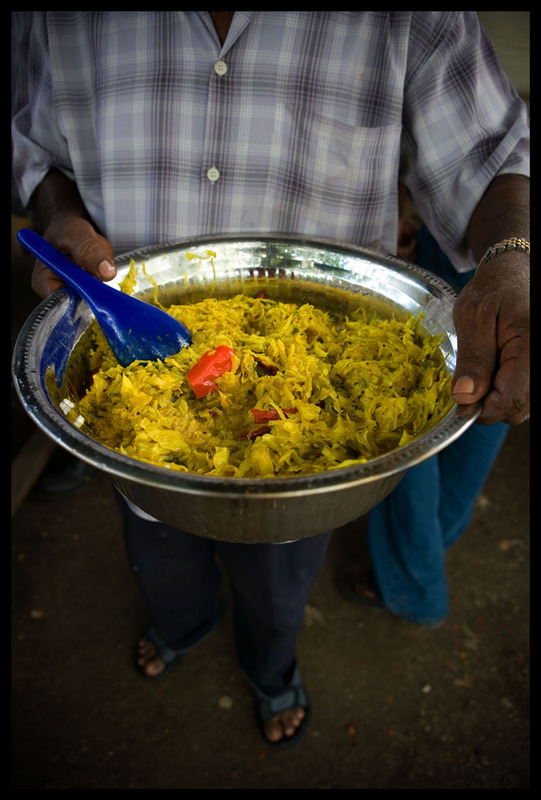 We chat with a man who's brother supplied the delicious food; he himself is retired from 30-plus years in the kitchen of the French Embassy. 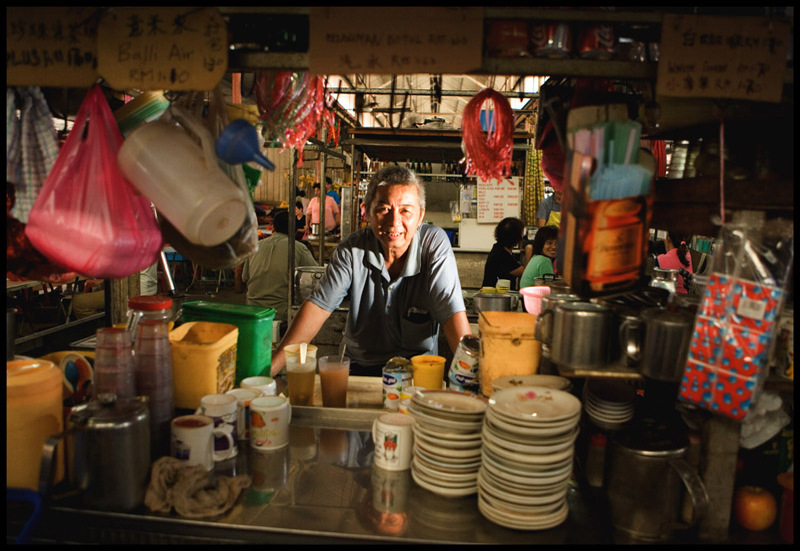 He also owns a small temple in KL, he says, and holds a ceremony there every year. Feeling incredibly full - and lucky, to have stumbled across this occasion and been invited to participate - we take our leave and head back to the car, carrying our bag of blessed fruit. Note: Many thanks to our hosts. 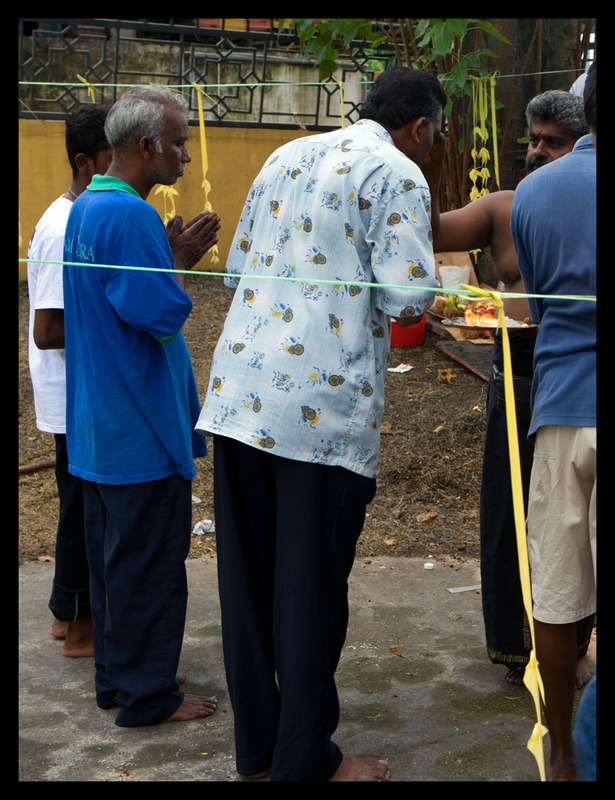 This is but one of several occasions on which we have been welcomed - with grace and wide-open arms - to observe and photograph religious rituals observed by Malaysia's Indian community. Last year we documented another, larger gathering, here and here. 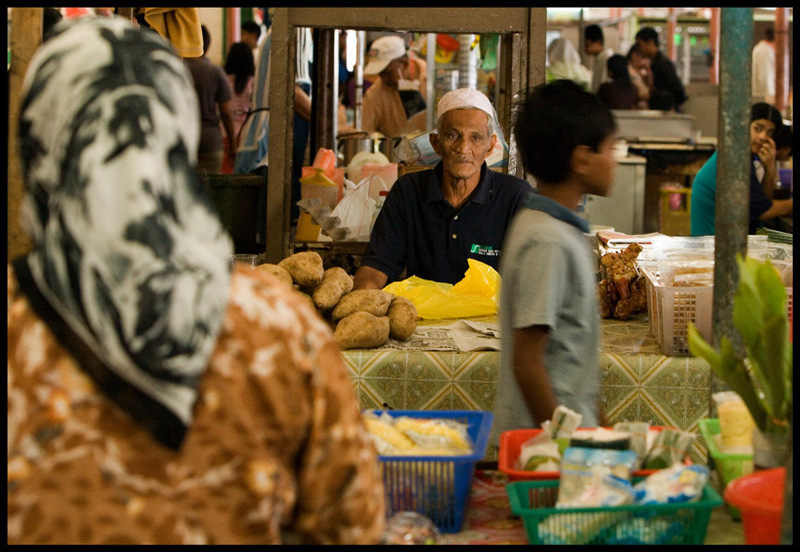 Saveur's January-February issue points readers to one of Kuala Lumpur's best-kept culinary secrets: Ramadan markets! See number 40 in the Saveur 100 (print only).